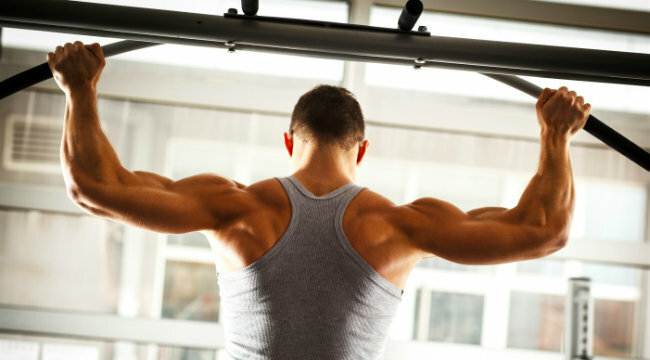 Add pullups to your routine for a tailor-terrorizing back. At the local powder-puff gym, you will see people lining up to use the lat pull down machine and maybe one lonesome soldier toiling away on the pull up bar. When it comes to back development and building a nice tapered-V look, the pullup is king. The pullup is what is classified as a closed kinetic chain (CKC) exercise (your effort moves you, rather than an open kinetic chain where your effort moves an object), which is safer and more functional than an open kinetic chain exercise. CKC exercises are able to build functional strength because they train the body to move its own weight, a prerequisite for almost any real world event. CKC exercises are also safer because they allow an individual's body structure to determine the movement pattern of the joints. This allows for a more natural range of motion and may reduce stress on joints. Pullup – The classic pullup is executed with a pronated grip (palms facing away from you). Works the upper back, shoulders, lats, and abs. Chinup – Performed with a supinated grip (palms facing you). This slight difference in grip will really hit the biceps - and who doesn’t want bigger biceps? Alternate Grip Pullup – This is a pullup performed with a deadlift or alternated grip. One hand is pronated and one is supinated. The benefit of the alternate grip is that this hand placement closely mimics the grip most often used in grappling. The Commando Pullup – Grab the bar like a baseball bat and pull yourself up alongside your ear until your trap hits the bar, then repeat on the other side. This hits the lats extra hard as well as the obliques. You can also add weight to any of these variations for a killer exercise. An easy way to begin to add these to your regimen is the Pyramid Method. To do this you pick a top number, for a beginner it may be ten. You start by doing one pull-up, then rest 30 seconds, then do 2 pullups, then rest 30 seconds, then do 3 pullups, and so on until you get to ten, then you start heading back down the pyramid by doing 9, then 8, etc. until you are back down to 1. What If I Can't Do a Pullup? If you have trouble performing pullups, don’t worry, Rome wasn’t built in a day. Whatever you do, STAY AWAY FROM THE PULLUP MACHINE! If you can’t do pullups right now, start out by doing either partner or band assisted pullups. Keep track of your progress and use a smaller band each week, so you are pulling more of the load. In no time at all, you will be cranking out legit pullups. Slow negatives are another variation that can be used by the beginner. Negatives provide a hellacious muscle building overload. Put a box next to the pullup bar and get your chin over the bar, and slowly (as slow as possible) let yourself down until your arms are fully extended, then repeat for sets of 5-8 reps. Even if you have access to a lat pull down machine, do not fool yourself into thinking it is as effective as the pullup or its variations. Nothing builds massive upper backs and lats like pullups do, just look at an athlete like a gymnast who uses pullup variations as their primary means of upper back training, or watch an episode of “Lock Up.” Without access to any weights convicts are still building backs that will terrorize tailors...if they ever get released.